St Nonna at Altarnun well deserves the three stars that Simon Jenkins awards it. If anything, we would say he was almost mean since there is almost endless fascination in trying to decipher the C16 bench-ends. 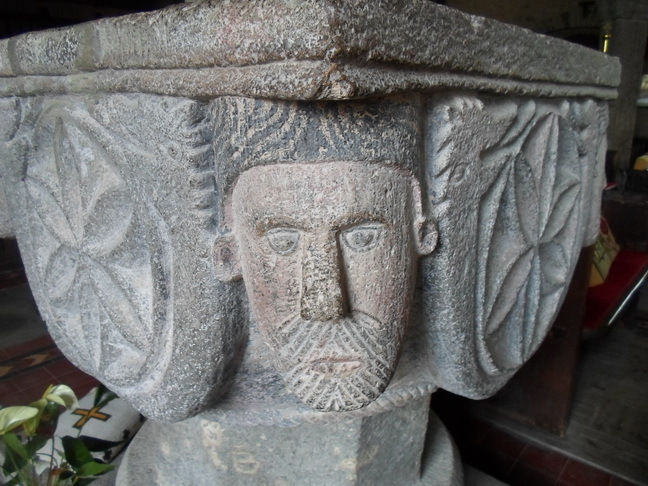 These vary from the secular – a green man – to religious, to simple geometric designs. The wood has hardened and darkened with age. The carved wording on the altar rail is also early and was clearly put there by some shy retiring individuals whose names are spelled out in for all to see. Add in the magnificent font and the large, airy space and St Nonna stays long in the memory. Altarnun is sometimes known as ‘the cathedral of the moors’ for its size: its tower is one of the largest in Cornwall. It is well-hidden, however, being almost invisible until you are quite close to it for the village lies in a deep dip. Simon Jenkins draws attention to an added attraction: just outside is a small bridge which is just the sort of bridge under which he is convinced that trolls live. How can you resist a visit?